St. Richard Church Bald Knob 4 p.m.
Sacred Heart of Mary Church Barling 6 p.m.
Our Lady of Fatima Church Benton 5 p.m.
St. Michael Church Cherokee Village 4 p.m.
St. Joseph Church Conway 4 p.m.
St. Joseph the Worker Church Corning 4 p.m.
Holy Trinity Church England 4:30 p.m.
Good Shepherd Church Fordyce 4 p.m.
Christ the King Church Fort Smith 6 p.m.
Immaculate Conception Church Fort Smith 5 p.m.
St. Boniface Church Fort Smith 4 p.m.
Mary Mother of God Church Harrison 5 p.m.
St. Albert Church Heber Springs 5 p.m.
Church of St. John the Baptist Hot Springs 5 p.m.
St. Mary of the Springs Church Hot Springs 4 p.m.
Sacred Heart of Jesus Church Hot Springs Village 5 p.m.
St. Jude the Apostle Church Jacksonville 5 p.m.
Sts. Sabina and Mary Church Jenny Lind 4 p.m. Blessed Sacrament Church Jonesboro 5:30 p.m.
Our Lady of the Lake Church Lake Village 5 p.m.
Cathedral of St. Andrew Little Rock 4:30 p.m.
Christ the King Church Little Rock 5 p.m.
Our Lady of Good Counsel Church Little Rock 4:30 p.m.
Our Lady of the Holy Souls Church Little Rock 4 p.m.
St. Edward Church Little Rock 4 p.m.
St. Andrew Church Marianna 5:30 p.m.
St. Norbert Church Marked Tree 5:30 p.m.
St. Mary Church McCrory 5 p.m.
St. Mary Church McGehee 5 p.m.
St. Peter the Fisherman Church Mountain Home 4 p.m.
Immaculate Conception Church North Little Rock 4:30 p.m.
Immaculate Heart of Mary Church North Little Rock 5 p.m.
St. Anne Church North Little Rock 4 p.m.
St. Mary Church North Little Rock 4 p.m.
St. Patrick Church North Little Rock 4 p.m.
St. Mary Church Paragould 6:30 p.m.
St. Joseph Church Pine Bluff 5 p.m.
St. Paul the Apostle Church Pocahontas 6 p.m.
St. Francis of Assisi Church Roland 5 p.m.
Holy Rosary Church Stuttgart 5 p.m.
St. Michael Church Van Buren 4 p.m.
Immaculate Heart of Mary Church Walnut Ridge 4 p.m.
St. Michael Church West Memphis 5 p.m.
Immaculate Conception Church Blytheville 11 a.m.
St. John the Baptist Church Brinkley 9 a.m.
Sacred Heart of Jesus Church Crawfordsville 8:30 a.m.
Holy Cross Church Crossett 11:30 a.m.
Holy Child of Jesus Church Dumas 11:15 a.m.
St. John the Baptist Church Engelberg 8 a.m.
St. Francis of Assisi Church Forrest City 10:45 a.m.
Mary Mother of God Church Harrison 8:30 a.m.
St. Leo Church Hartford 11:30 a.m.
St. Mary Church Helena 10 a.m.
St. Mary of the Mount Church Horseshoe Bend 11:15 a.m.
Sacred Heart of Jesus Church Hot Springs Village 8 a.m., 10 a.m.
Holy Family Parish Jacksonville 9:30 a.m. 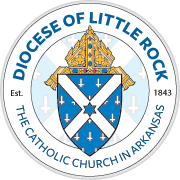 Blessed John Newman University Parish Jonesboro 5:30 p.m.
Our Lady of the Lake Church Lake Village 9 a.m.
Cathedral of St. Andrew Little Rock 8:30 a.m., 12:05 p.m., 5:30 p.m.
Christ the King Church Little Rock 8 a.m., 10:30 a.m., 12:15 p.m., 6 p.m.
Our Lady of the Holy Souls Church Little Rock 8 a.m., 10:30 a.m., 5:30 p.m.
St. Bartholomew Church Little Rock 8:30 a.m.
St. John the Baptist Church Malvern 9 a.m.
St. Mark Church Monticello 9 a.m.
St. Mary Church Mountain View 10:30 a.m.
St. Cecilia Church Newport 8:30 a.m.
Immaculate Conception Church North Little Rock 8 a.m., 10:30 a.m., 5 p.m.
Immaculate Heart of Mary Church North Little Rock 8 a.m., 10:30 a.m.
St. Matthew Church Osceola 9 a.m.
St. Mary Church Paragould 9:30 a.m.
St. Joseph Church Pine Bluff 11 a.m.
St. Paul the Apostle Church Pocahontas 10:30 a.m.
St. James Church Searcy 8:30 a.m.
Holy Cross Church Sheridan 9 a.m.
Sts. Cyril and Methodius Church Slovak 8:30 a.m.
St. Anthony Church Weiner 8 a.m.
St. Michael Church West Memphis 10:30 a.m.
St. Andrew Church Yellville 11 a.m.
St. Michael Church Cherokee Village 9 a.m.
St. Joseph Church Conway 7 a.m., 12:15 p.m.
Immaculate Conception Church Fort Smith 7 a.m.
Church of St. John the Baptist Hot Springs 8 a.m.
Holy Family Parish Jacksonville 11:30 a.m. Blessed John Newman University Parish Jonesboro 7 a.m. Blessed Sacrament Church Jonesboro 7 a.m.
Cathedral of St. Andrew Little Rock 12:05 p.m.
Christ the King Church Little Rock 7:50 a.m.
Our Lady of the Holy Souls Church Little Rock 7 a.m.
St. Mark Church Monticello 5:30 p.m.
St. Peter the Fisherman Church Mountain Home 7:15 a.m.
St. Mary Church Mountain View 5:30 p.m.
St. Joseph Church Pine Bluff 8 a.m.
St. Paul the Apostle Church Pocahontas 8 a.m.
Holy Rosary Church Stuttgart 9 a.m.
St. Michael Church Van Buren 8 a.m.
St. Peter Church Wynne 8 a.m.
St. Mary Church Batesville 6 p.m.
Immaculate Conception Church Blytheville 6 p.m.
St. Joseph Church Conway 6 p.m.
St. Boniface Church Fort Smith 6 p.m.
Mary Mother of God Church Harrison 5:30 p.m.
St. Mary Church Helena 8 a.m.
Sacred Heart of Jesus Church Hot Springs Village 9 a.m.
St. Jude the Apostle Church Jacksonville 6 p.m.
Sts. Sabina and Mary Church Jenny Lind 5:30 p.m.
Our Lady of the Lake Church Lake Village 8 a.m.
Our Lady of Good Counsel Church Little Rock 8 a.m.
St. Edward Church Little Rock 6 p.m.
St. Mary Church Mountain View 8:30 a.m.
Immaculate Conception Church North Little Rock 8:15 a.m.
Immaculate Heart of Mary Church North Little Rock 6 p.m.
St. Anne Church North Little Rock 6:45 a.m.
St. Peter Church Pine Bluff 5:30 p.m.
Immaculate Heart of Mary Church Walnut Ridge 5:30 p.m.
St. Michael Church West Memphis 6 p.m.
Immaculate Conception Church Blytheville 8 a.m.
St. John the Baptist Church Brinkley 5 p.m.
St. Michael Church Cherokee Village 6 p.m.
Holy Cross Church Crossett 5:30 p.m.
Christ the King Church Little Rock 7:50 a.m., 12:05 p.m., 6 p.m.
Our Lady of the Holy Souls Church Little Rock 5:30 p.m.
St. Peter the Fisherman Church Mountain Home 7:15 a.m., 5:15 p.m.
Immaculate Conception Church North Little Rock 6:45 a.m., 8:15 a.m.
Immaculate Heart of Mary Church North Little Rock 8:15 a.m.
St. Anne Church North Little Rock 6 p.m.
St. Mary Church Paragould 6 p.m.
St. Joseph Church Pine Bluff 5:30 p.m.
St. Peter Church Pine Bluff 8:30 a.m.
St. James Church Searcy 6 p.m.
Holy Rosary Church Stuttgart 5:30 p.m.
St. Michael Church Van Buren 8 a.m.; 5:30 p.m.
St. Jude Thaddeus Church Waldron 9 a.m.
St. Michael Church West Memphis 8 a.m.
Our Lady of Fatima Church Benton 9 a.m.
St. Boniface Church Fort Smith 8:15 a.m.
St. Albert Church Heber Springs 9 a.m.
St. Jude the Apostle Church Jacksonville 8 a.m.
St. Bartholomew Church Little Rock 5:30 p.m.
St. Cecilia Church Newport 5:30 p.m.
St. Mary Church Paragould 8 a.m.
St. Paul the Apostle Church Pocahontas 12:15 p.m.
Sts. Cyril and Methodius Church Slovak 6 p.m.
Holy Rosary Church Stuttgart 10:30 a.m.
St. Peter Church Wynne 12:05 p.m.
Christ the King Church Little Rock 7:50 a.m., 12:05 p.m.
St. Paul the Apostle Church Pocahontas 9 a.m.
Our Lady of the Holy Souls Church Little Rock 8 a.m.
St. Michael Church Cherokee Village Vigil 6 p.m.; 9 a.m.
Sacred Heart of Jesus Church Hot Springs Village Vigil as announced; 9 a.m.
St. Jude the Apostle Church Jacksonville Vigil 7 p.m.; 8 a.m.
Cathedral of St. Andrew Little Rock Vigil 5:30 p.m.; 12:05 p.m., 5:30 p.m.
Our Lady of the Holy Souls Church Little Rock Vigil 5:30 p.m.; 7 a.m (summer) or 8:15 a.m. (school year), 5:30 p.m.
Immaculate Conception Church North Little Rock 8:15 a.m., 7 p.m.; Vigil 7 p.m.
St. Francis of Assisi Church Roland 10 a.m.